Emma is definitely my favourite, although I am always a bit of a sucker for unreliable narrators. Funny you say that because I’ve been wondering the last couple of weeks whether there is such a thing as a reliable narrator at all. Any first-person narrator, or any character rendered through free indirect speech, will present herself as she sees herself. For example, I don’t think Emma sees herself as a snob. I do (although I forgive her for it). Which one of us is right? Also, the problem doesn’t get any easier with third-person narrators — it just kicks it up to the author’s level. Austen presents her characters as she sees them. Is Mrs. Elton really as bad as Austen makes her? In the novel, I guess so. Thanks for the comment. I completely agree. I always–right away–try to determine the perspective of the narrator so I can notice what gets left out of the story or where I am ‘misdirected.’ Reading for what isn’t included is difficult, but so rewarding. We always finish the story the writer starts, don’t we? Thanks! As I write, I say to myself, “Please, God, let me just say one thing that is new or different” — particularly when the subject is an author as well known as Austen. Thinking of dusting off my old notes on Pride and Prejudice and Zombies, just to complete the collection. 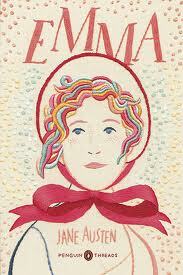 Emma was the firs Austen novel I ever read, and I absolutely loved it. I’d never much Thought about is differences from other Austen novels, though. I think you’ve hit the nail on the head when you call it a comedy. I found Pride and Prejudice to be really funny, but that was mostly because of its comic side characters (especially Mr and Mrs Bennett); it wasn’t shot through with comedy in the same way as Emma. I’m glad you mentioned the funny parts of “Pride” because I’d been wondering if I should have mentioned them. P&P has comedy, but it’s not the dominant tone, which is a better way of saying what I meant, but didn’t actually write. And comedy doesn’t seem to be a major part of most other Austen novels (with the exception, perhaps, of a few bits of Northanger Abbey), which was kind of confusing to me (since I first came at Austen through Emma). She _was_ really versatile. Also, it’s interesting that you assume knowledge of Emma’s plot is widely known. Before I read the book, the only thing I knew about it was that it was the basis for the movie _Clueless_. As I read, I realized that Emma was Alicia Silverstone and Harriet was Brittany Murphy and Mr. Knightley was Paul Rudd. But I kept trying to figure out who this Jane Fairfax woman was. I figured that she couldn’t be that important, if she hadn’t managed to make it into the movie. Also, I kept thinking that Frank Churchill was going to turn out to be gay. As such, the end of the novel really took me by surprise. I figured anyone who found their way to my very small corner of the world would be likely to already know the book. Also, the Gwyneth Paltrow movie seems stuck in the minds of people my age (firmly in my 40s … sigh). There was an explosion of “Emmas” afterwards, anyhow. If fact, our first child was going to be an Emma until it turns out he was an Evan. But your point is right: my assumptions aren’t necessarily true. When you wrote the above quoted comments, you actually had what I call a “Trojan Horse Moment”, courtesy of Jane Austen!